Used to treat Wind-Heat syndrome associated with the common cold or flu. There are strong antibacterial herbs in this formula. It is effective against strep infections affecting the throat, sinus and eye, and can be used for early bacterial infections of the lung. The use of rhubarb follows the principle of purging heat toxins through the stool. Huang Lian Shang Ching Pien is used to for Wind-Heat syndrome associated with the common cold or flu. There are strong antibacterial herbs in this formula. It is effective against strep infections affecting the throat, sinus and eye, and can be used for early bacterial infections of the lung. The use of rhubarb follows the principle of purging heat toxins through the stool. Clears heat, drains fire, resolves toxins, dispels pathogenic wind, frees the stool, benefits the eyes, opens the orifices, relieves pain. Relieve Fire, Dispel Wind-Heat, Clear Wind-Heat, Promote bowel movement. Use for toxic damp heat accumulation (bacterial infection) in the upper Jiao causing common cold, flu with symptoms of fever, headache, dizziness, tinnitus, mouth ulcers, swollen gums, sore throat, conjunctivitis, toothache, or constipation. Hypertension with symptoms of dizziness, headache, red eyes, flushed face associated with Wind-Heat syndrome. Tonsillitis, parotitis, otitis media, acute bronchitis, acute pneumonia, pulmonary abscess, and skin infections including sores, carbuncles, boils, all with heat signs. The rhubarb in this formula may cause diarrhea in most cases. Reduce dosage accordingly. The formula should be discontinued once heat symptoms subside or change. Do not take during pregnancy. 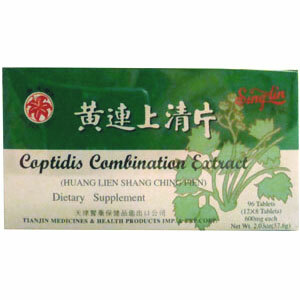 Be the first to review “Huang Lian Shang Qing Pian – Coptidis Combination Extract” Click here to cancel reply.